Sweetsalt Food Shop - Sweet Valley Lunch Spot! Though the site of increasingly frequent sightings of tween celebrities, Toluca Lake is unmistakably suburban, thus far without real culinary stars to claim as its own. Imagine my excitement when I heard of new-comer Sweetsalt, a tiny cafe slash to-go retail counter opened by former Top Chef contender Alex Eusebio (Season 5). I love the simple, clean layout of the store and its concept - with its serene white interiors with black trim, and its centerpiece marble counter - it reminds me of Joan's On Third, but at about a fifth of the size. It's an intimate space with just a handful of tables inside a turn-of-the-century-style storefront (and two tables outside). It also reminds me of a place that you would see on the main strip at St. Helena up in Napa Valley - and I actually did feel like I had a mini-getaway at lunch! Diners place their order at the counter, get a card with a number to put on your table, and a server brings out the food when it's ready. The menu consists of mouth-watering sandwich creations (including lavender duck confit, short rib roll), salads (fig with mache, bacon and blue-cheese crostini, champagne chicken, organic grains - a mix of quinoa and couscous with veggies. You can also make your own! ), daily soups, a cheese and charcuterie plate for $15, and homemade desserts. I find it difficult to resist anything with the word 'truffle' in it - so my eyes, and money, immediately went to the Shitake Truffle Panini ($9) - which was probably the best sandwich I've ever had in this neighborhood - with Shitake mushrooms, sottocenere (my favorite cheese), alfalfa sprouts, onion confit, and truffle oil. The panini comes on a rustic silver metal plate with a side of mesclun with a simple vinaigrette dressing. The truffle flavors were infused throughout the sandwich - which caused me to practically inhale it. My friend got the Pesto Panini - with basil pesto, roasted pepper, mozzarella, and arugula - and though a bit oily, she enjoyed it. We were happy to get the table for two right by the sun-lit window, and found the experience a very pleasant way to pass our lunch hour. For dessert, we split an 'Xtreme' sweet ($3.75) - a red velvet cookie that looks like a giant Parisian-style macaroon, with some graham cracker crumbs on top. I had high hopes for this sweet, but unfortunately the cookie was not nearly light and flaky enough, and the center filling was a single-note disappointment - so sugary I couldn't taste the vanilla. Whereas everything else in the store was reasonably priced, we were soured on the experience with the 'Xtreme Sweet' - that is one we are unlikely to repeat. Sweetsalt is, all-in-all, a great lunch spot, for those who want a great gourmet sandwich and refuse to settle for Subway just because they happen to be in the Valley. The concept of leaving any decent restaurant in Beverly Hills, stuffed, seems in itself an impossibility (at least, when working with a subsistence budget like mine!) - but such was my experience this Saturday evening. Nestled in a quiet, cozy space on Canon Dr., next to its larger, bustling and more prominently situated sister restaurant Il Pastaio, Enoteca Drago is an unassuming place that is refreshingly free of pretension given its neighborhood. Though the dining room decor felt a little staid, with tapestry-fabric lined and cherry wood paneled padded seats along the walls and matching cherry wood chairs, we felt we were off to a good experience when we were greeted by a warm, friendly server - who rattled off a long and appetizing list of specials, and gave us just the right amount of time to peruse the a la carte menu. We soon noticed though that they were rotating a team of servers to our table, and my friend 'Lindyhopper' was mistakenly delivered a diet soda when she had asked for regular. Minor detail which they promptly corrected by bringing her a replacement. The word 'burrata' triggered memories of the divine appetizer I had (and still dream of) at Osteria Mozza - so I thought I'd give this salad a try. The consistency and taste of the cheese unfortunately did not measure up to the absolute sublime that was the appetizer I had at O.M. (not sure that anything ever will!) - but I give the dish high marks for an interesting combination of tastes and creamy/crunchy textures, and value (the portion size was gargantuan - I could have filled up on the salad alone). 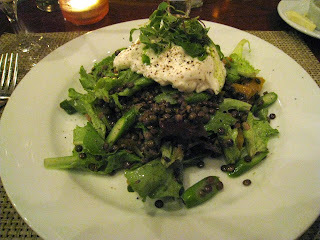 Areas for improvement, besides the quality of the burrata, were the amount of lentils (there was so much of it on the plate, I was getting tired of chewing on them just several minutes in - if they had removed about half of the lentils, and it would have been perfect), and presentation (not sure what kind of beets they used, but they were a dull, washed out greyish-brown color which was not so appetizing; the stockpiling of lentils also affected the presentation - the whole composition just seemed slapped together - with a ball of burrata slapped callously onto a pile of greens and browns). As simple a dish as polenta is, apparently it is extremely difficult to get the consistency and taste right - I know because I've let my excitement soar on several occasions upon seeing the rare item on LA menus, only to be sorely disappointed upon first taste. Often, the polenta is made too thin and watery, or too dense and rubbery (like what I would imagine a patty made of a hybrid of of styrofoam and rubber would taste and feel like), and either too salty (one-note) or too bland. The only place where I have experienced a perfect polenta, is at BLT Steak - they made an amazing rosemary polenta - which unfortunately made an appearance as a special, only once on the menu. I have been craving it ever since and they have never brought it back in the dozens of times I had returned to the place since. Being ever the (naive) optimist - I keep giving polenta a chance at new venues to see if I can find another good one. 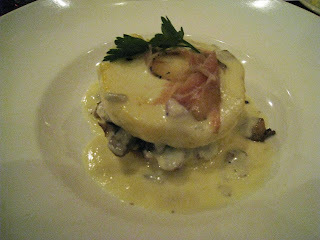 I would say the Polenta and Funghi starter at Enoteca Drago is very good, but falls shy of greatness. Polenta is also known as 'grits' in the US - aptly named as, well, the texture should taste - gritty - in a good way. I was torn between Bottarga ($16) Spaghetti with Cured Tuna Roe, Bread Crumbs, Parsley & Extra Virgin Olive Oil...and Raviolini ai Funghi ($18) Mushroom Filled, Foie Grass and Truffle Sauce, and the tagliolini. Though there were quite a few ingredients in this dish, the taste was one-note. 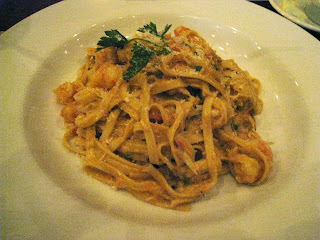 Pasta sort of melded together in a pile by saffron colored lobster sauce. 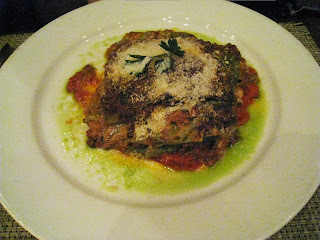 I tried a few bites of Lindyhopper's lasagna - and it was fairly good - layers of spinach pasta sheets topped by crunchy crumbs of parmesan. NOT slathered with sauce and dense slops of cheese as is typical with lesser Italian food venues. I did like that the ratio of sauce and cheese to pasta sheets was just right, and each bite did not sink like a brick going down. We were so full after the rich meal, that we decided just to share one dessert. 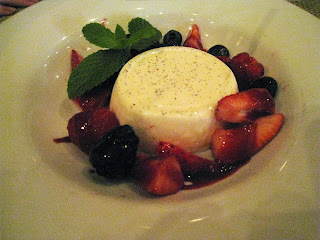 The panna cotta was smooth and creamy - though just ever slightly too stiff. The fruit also didn't exactly taste Farmer's Market fresh. But I'm a huge dessert person so I may just be overly picky here! All in all, a nice night out - a filling, relatively tasty meal in a pleasant setting - not much more a budget-conscious foodie can ask for, at least within this neighborhood.